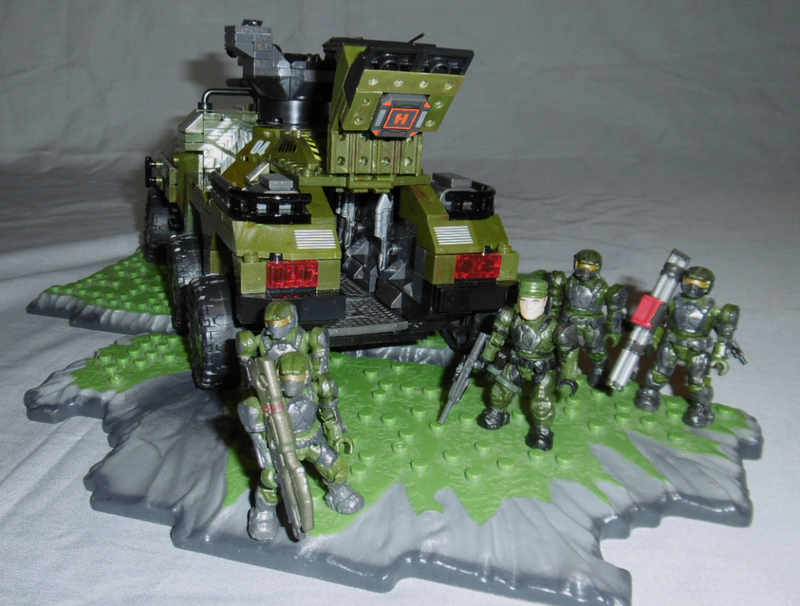 Nearly a decade ago my then 4 year old son and I discovered MB Halo. While Russ was too young to play Halo on the Xbox at the time (He was sure curious about it-LOL! 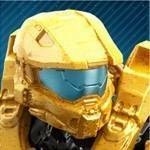 ), I was already keenly into the Halo universe via the Xbox games and books. 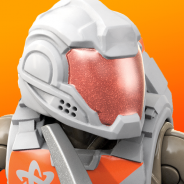 Lets just say a building block expansion of the Halo universe really checked some boxes for me as I was thoroughly embracing my 2nd childhood along with my son. 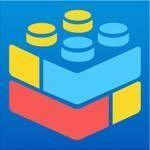 Within the first year of rapidly collecting MB Halo I discovered the (now defunct) Spartan Bloks forum and its then vibrant community of collectors and custom builders. 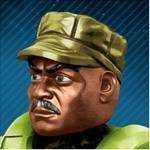 Well Rich Bubik, aka Goodwill Hunter rocked my brick building world back then. 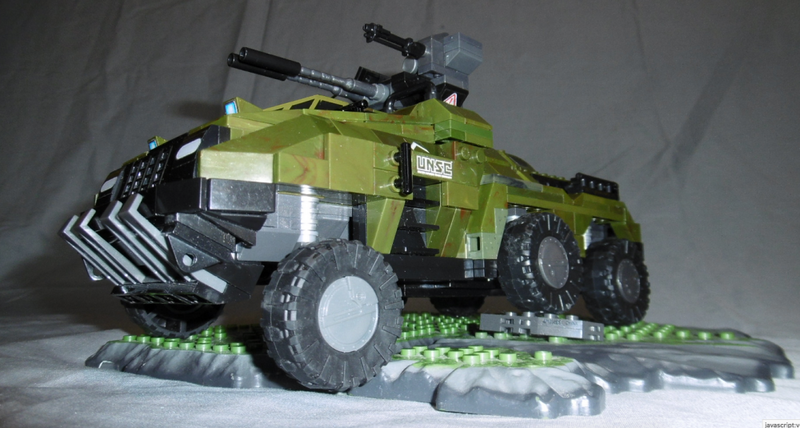 GWH was a master at creating clever and game-accurate custom builds of Halo vehicles which MB hadn’t gotten around to yet. 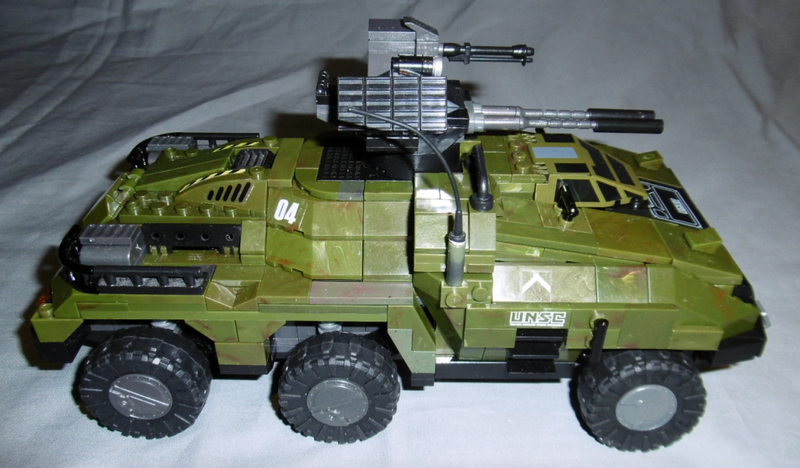 One of my favourite GWH builds way back then was that of a cancelled vehicle originally slated for Ensemble Studios’ Halo Wars 1 universe, the UNSC Cougar. Clearly I wasn’t the only person who loved that build. Along with me, several other Blok heads “went to school” on GWH’s Cougar and built there own versions. Well if imitation is the sincerest form of flattery, Rich ought to have been mighty proud- LOL! All those other Cougar customs, my own included, unashamedly stole the most distinctive elements of Rich’s build. So here we are all these years later. My original intent was just to post pics of my many-years-old Cougar custom on the MCX gallery ‘cuz to date I’d not done so. Instead I decided to build an entirely new Cougar model that would benefit from nearly a decade of learning new brick building techniques over several hundred MB/MCX Halo rebuilds and customs. For this new build I would not reference or borrow from any past custom Cougar builds. This one would be 100% me and the only references would be Ensemble Studio’s original concept art and renders. The end result was remarkably different from any brick HW Cougar custom I’ve ever come across on the net. For fun a few of the pics contrast my original GWH inspired build with the new one. This time around I managed to create the Cougar’s blunted wedge shape front end WITHOUT resorting to separate front and rear vehicle sections connected by a hinge. This gives the finished custom a totally different look than any custom Cougar I’ve seen previously, as every single example borrowed Goodwill Hunter’s hinged and angled wedge front end. Getting this aspect of the model figured out was the most time consuming part of the build and the design element I’m most chuffed about. While I still really like the aesthetic of the original design GWH came up with, I think my latest build bears a much stronger resemblance to Ensemble’s concept art. What do you think? Other than the shape of the vehicle, Ensemble didn’t provide any definitive evidence as to the whether the Cougar was simply a speedy wheeled tank killer with its pair of Gauss cannons and heavy machine gun, or as I suspect- an APC. 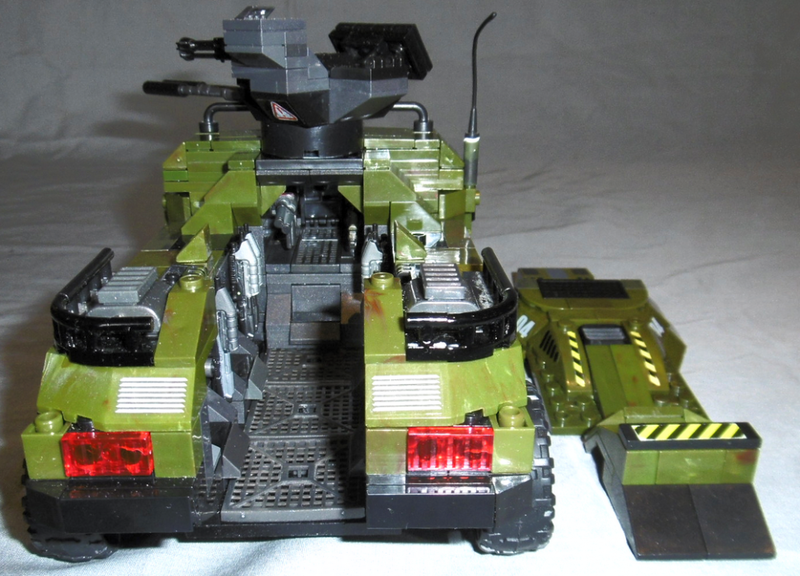 The handful of official pics (all taken from the front or side) and cursory accompanying descriptions simply state that the Cougar was intended to be a fast lightweight anti-armor vehicle. A clear pic of the rear end of the vehicle would have answered the question definitively. Hatch or no hatch. Unfortunately no such artwork or CGI render appears to exist. 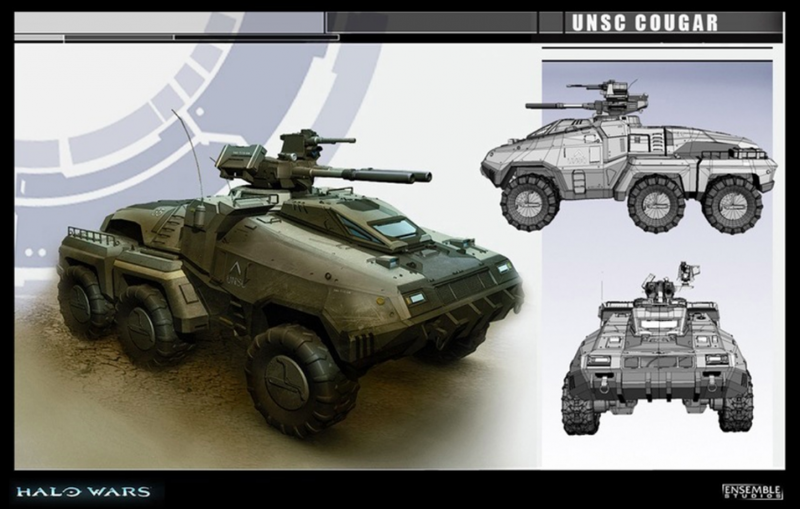 However when you consider the relatively small turret and voluminous hull shape of the Cougar concept art, I think you can make a pretty compelling case for the Cougar being a well armed and armored troop carrier- sort of a futuristic Stryker. So like my original Cougar custom, I made use of all that volume inside the hull to accommodate 5 troops in the back plus the driver. There is no weapons operator in a Cougar as apparently the guns are “computer controlled”. 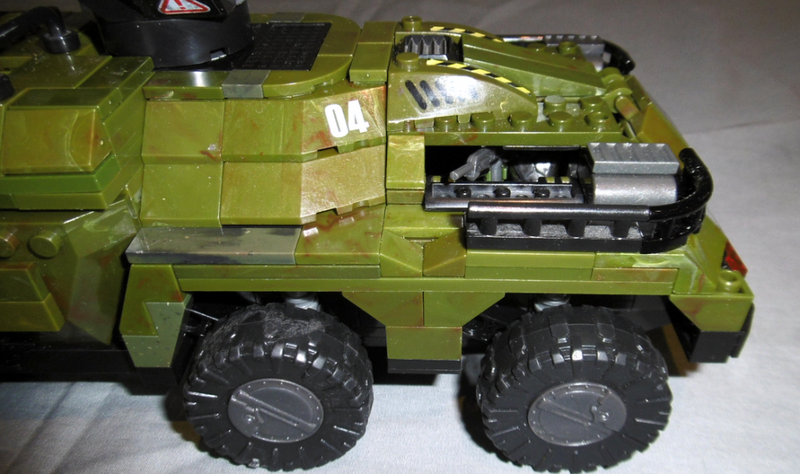 I imagineered the blacked out sections on either side of the APC’s dorsal hump, as flip down armored gun ports. As usual there is a lot of detail work here, some of it pretty subtle. In contrast to the mostly olive green camo exterior I did the undercarriage and cabin interior in dark grey. This made the faux suspension springs and Warthog style swingarm suspension on all 6 wheels visible. Also check out the seating and weapon racks in the troop cabin. As the Cougar’s primary role is anti-armor, it occurred to me that the Marine fire team onboard should be equipped similarly. 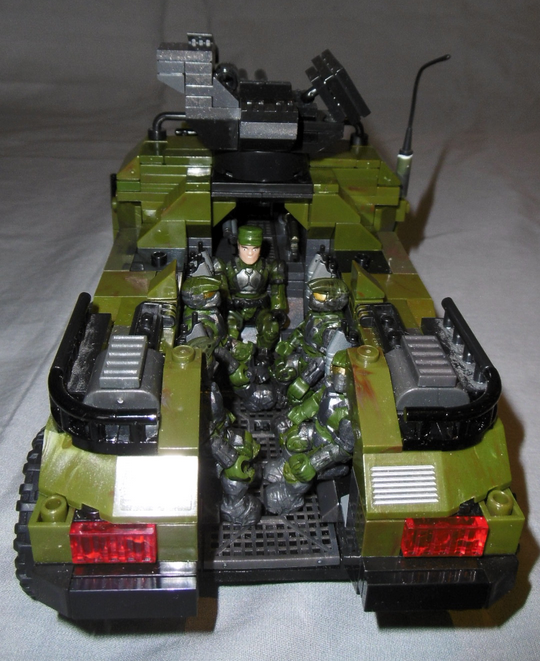 Hence the Spartan Laser and Rocker Launcher racked in the crawl-way between the cockpit and troop cabin. Finally there is a Health Pack on the interior of the rear hatch. Hope you liked this build. I’m always open to constructive criticism and curious to hear your thoughts on old vs new. Oh, shoot, I completely missed that! You're right, though, it certainly does improve the look of the build. It looks cleaner, in my opinion, and more natural. Not to mention closer to the concept art. And I also see the resemblance to the Stryker you mentioned. They both look great, but ten years of buildig can sure cause improvement! 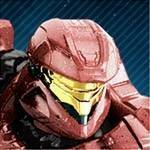 Hey there @JoeFilms, @HaloGuy92, @81Ceta_Deta, and @ MegaC Thank you. I very much appreciate the compliments. However none of you answered the question I asked in my long-winded accompanying post. In the pair of pics which show both new (left) and old builds, which do you like better and why?